The German mobile service "Call a Bike" shows, that mobile services do not only need to be virtual. This year the mobile phone based bike-sharing service is rolled out in Stuttgart, the city you probably know as the home of DaimlerChrysler. The system is quite simple to use: At all major crossings within the city users can rent a bike with a mobile phone call – and return it. 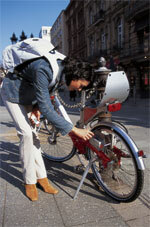 The user receives a code via SMS to his or her mobile phone and is able to open the electronic lock of the bike. Returning the bike is as easy as renting it: Just leave it at a major crossing and check out with another phone call and the deactivation code of the electronic lock. The registered user is charged by minute. The computer scientist and entrepreneur Christian Hogl came up with the idea for "Call a Bike" in 1998. In the year 2000, the system was rolled out in Munich. Although the user growth was enormous from the beginning, the concept did economically succeed only in the second try – now owned by the German railway company "Deutsche Bahn". Today the system is rolled out also in Berlin, Frankfurt am Main, Cologne and brand new: Stuttgart. At the moment, "Call a Bike" has more than 45.000 active users within Germany – and the rent is 6 to 8 Euro-cents a minute or flat rates for days and weeks. What about having call-a-bike in other capitals around the world?